...As the sun warms your face, watch as the first Bumble bee lazily skims the top of the lawn in search of its first clover…Whether you live in a high rise, in the centre of a city or in a tiny cottage, bring a little nature into your home so that you can escape the pressures of modern live, even if it is for a moment, before you leave for work, or to collect the children from school. I produce brightly coloured oil paintings about the tiny creatures and ecosystems around us that we simply do not have time to contemplate in our busy lives. I am based in the West Sussex countryside, where I draw and paint the smallest insect or flower. I notice the beauty in the dying forms of flowers or the vivid colours changing with the light of the sun, in between, trying to encourage my two cats to not sit on my easel or drawing board! I started growing plants from seed and painting flowers aged 3, my interest in growing flowers and observing the lives of tiny insects is just the same as my passion for painting them. I have been exhibiting my work since I graduated from a Fine Art degree in 2001, when I had a successful solo show that consequently gained me a studio residency, where I was based for 7 years. Since then I have exhibited both in the UK and abroad in both solo and selected group shows, and am featured in both public and private collections; selling to collectors in several countries including the UK and Canada. I am passionate about art and enjoy sharing my enthusiasm with the local community which includes exhibiting regularly with the Shoreham Art Gallery, where I enjoy meeting customers and discussing art. I teach on a one-one basis helping students gain GCSE’s, art scholarships, A Levels and mentoring fellow artists and I have taught both adults and children for over 15 years. 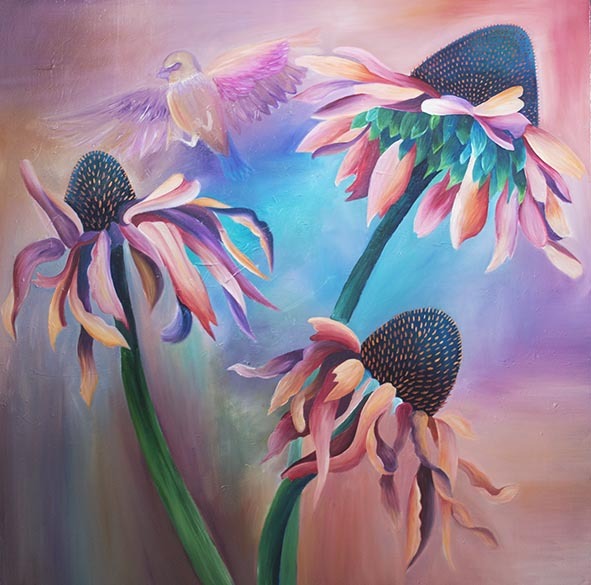 "Claire's work shows her deep love of nature in both her paintings and her photographs. 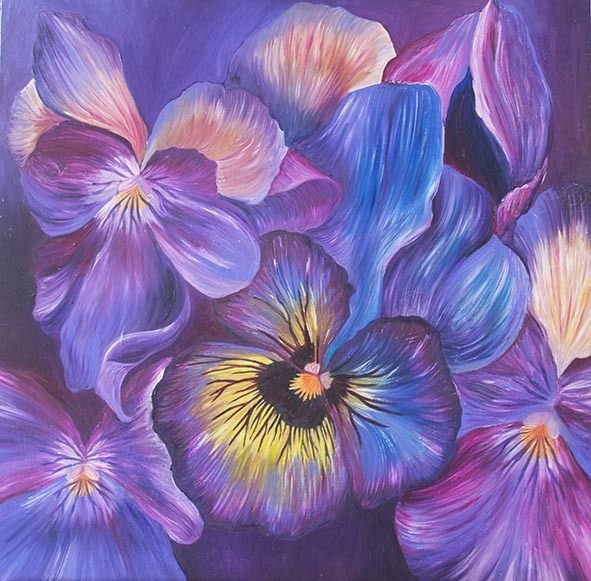 Her beautiful flowers are painted in such deep glowing colours that they fairly leap off the canvas at you, very often with a tiny insect or bird that sometimes one can only just see. There is a magical, slightly unreal, quality to her work that is very appealing."